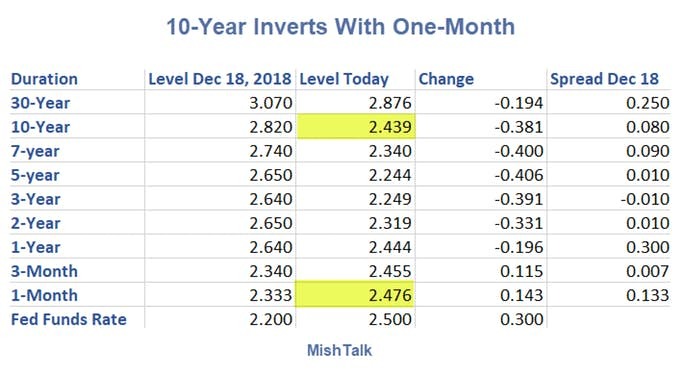 The yield curve nears full inversion. Every duration higher than 1-month other than the 30-year long bond is inverted. Those waiting for a full inversion before worrying about recession can start worrying today. There are too many inversions for me to draw all the arrows. Suffice it to say the 10-year note has now inverted with the 1-month T-Bill. And from the 5-Year Note through the 1-month T-bill, every duration level is inverted with every duration level beneath it. We have near-full inversion except for the 30-year long bond.